Byline Land Ahoy! ... After years of searching you have found her: Tobago, the island of forgotten treasures. 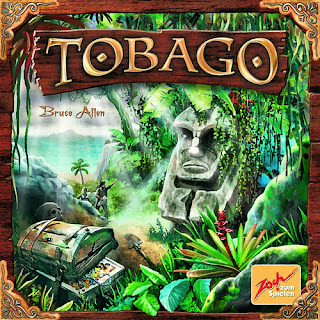 In Tobago the adventure begins when you assemble the modular board into one of 32 different scenarios. Then three types of monuments are placed randomly around the board. Somewhere on the island, four different treasures are buried. The adventurers now use clue cards to narrow down and finally identify exactly where each of the buried treasures are located. Now, the race is on to get your ATV across the various terrain tiles to be the first to arrive at and claim a buried treasure. Once the treasure is claimed, treasure cards will come into play to distribute the treasure amongst the adventurers who contributed clue cards for that treasure. Powerful amulets become available on the board once a treasure is raised and distributed. These amulets are claimed by racing your ATV in the same manner as you do for the treasures. Amulets grant powers that help players in almost every aspect of the game. The game ends after the treasure card deck runs out, but not before the treasure is distributed.